These boxed sets of 12 delightful greeting cards are sure to brighten the day of any person who receives one. 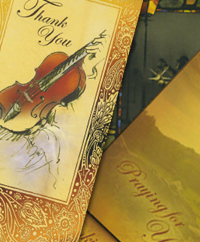 Each card includes beautiful art and meaningful Scripture. The inside of each card is blank so that you can make each sentiment personal. Demonstrate your thoughtfulness with our classic and stylish 4 1/4" x 5 1/2" cards.